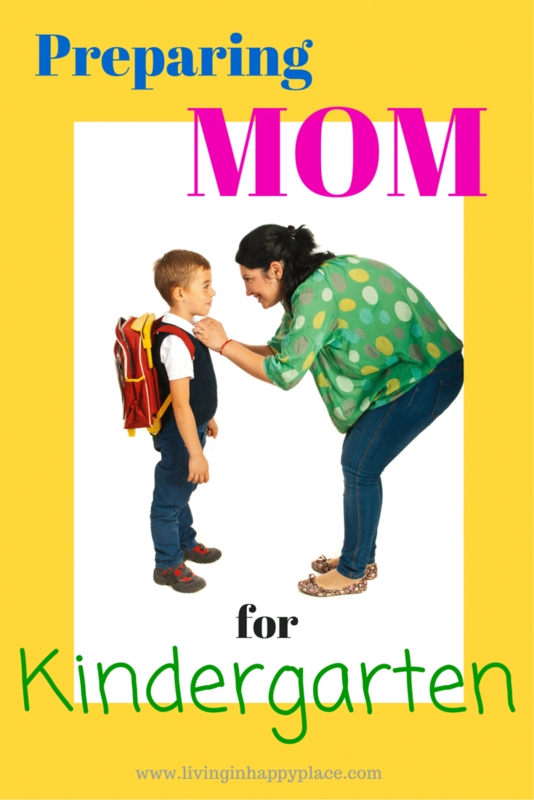 Preview: Preparing for kindergarten is sometimes harder for MOM than for the kindergartener! Tips for preparing for kindergarten! Preparing for kindergarten is more than just buying school supplies and getting cute back-to-school clothes! This is a huge step in your little one’s life and preparing for kindergarten success is a family affair! Often Mom needs preparation for kindergarten more than the child. You and your child can ease through the transition to kindergarten by having a few strategies in place. Knowing how to prepare your child emotionally for kindergarten (and preparing Mom emotionally!) is just as simple as planning his kindergarten activities! You got this Mom! Are you putting your precious baby on the bus for the first time this year? Are you more scared than he is? Sometimes it is MOM who needs to prepare for that huge trip to the first day of kindergarten! “One of the most amazing little boys is going to kindergarten this year. I remember the day his Dad held him up in the nursery window. I’ll never forget my first look at my new nephew. I could not have guessed how much he would change my life. You see, this little guy is the reason I changed my mind and decided that I did, in fact, want kids. He was the cutest, most precious little thing and he was so amazing that I NEEDED one! I will never be able to thank him for that gift he gave me. (I actually wrote that part a while ago: my nephew is now in third grade. Where does the time go?! Now I have a 5-year-old myself. One day they are toddling next to our feet and the next they are tieing their shoes on the way to kindergarten). So here is some support for the Moms who have to send their babies off into the cold, cruel world of kindergarten. Okay, for the kids it is actually the warm, fuzzy world of musical fun- but that is not how Mom sees it! I hope these stories provide you with some comfort that everything is going to be okay. At the end of that dreaded first day, when he comes home and tells you how much fun he had- you will be so proud of him. You should also be proud of yourself for doing the absolute hardest job in the whole world- and doing well. You have raised a helpless, tiny baby into a productive little student. Way to go Mom! Now we must prepare mom and child for the first big day. I don’t have a big secret that will make you not miss your kid. It is an instinct that cannot and should not be ignored. It is the call to protect our child. We can’t stop it, but we can manage it so they can learn their ABC’s! You can also leave little notes in their backpack or lunchbox, give them something of yours (such as a hair clip) to hold onto, or even a picture to keep in their pocket. A little token goes a long way when your child (or you!) is feeling sad. Tip! You don’t need to keep every masterpiece and have a house full of paper. Just take a picture of each piece and make a photo book of all their creations. This way you can treasure every piece of artwork without storing tons of paper! What do kids need when preparing for kindergarten? You’ve already bought the cute backpack, trendy lunchbox, and adorable back to school clothes. You even got the supply list from your new favorite kindergarten teacher. But what else does your child need to prepare for kindergarten? A few things we can’t buy at Target but can make all the difference this school year! ~ Help them feel secure– Using a mommy-and-me token from above is a great start. You can also explain that Mom or Dad will always come back to pick them up. Be prompt at pick up to reassure their trust. Try explaining where you will be and make it a point to connect with them as soon as you see them after their school day. An extra long hug or tight squeeze and saying “I missed you” can go along way in helping your child feel secure. ~Promise some extra family time– Since this is likely the longest they will be away from family, promise some extra family time to spend after school. I call this “filling their Mom bucket” so their hearts are full and they can concentrate on other things without needing to look for attention. Sign up for our free 7 Day Family Time Challenge to dedicate this little extra time that they need during the transition. ~ Work on the basics– Being familiar with the concepts they will learn in class is a great way to start off their school experience with confidence. Rehearsing letters, recognizing numbers, practicing scissor skills, and knowing how to listen during story time are really important to your child’s transition to kindergarten. Already being familiar with these skills helps your child transition to a school environment, feel confident in their abilities, and get excited about learning! Reading– According to the American Academy of Pediatrics, children who read aloud with their parents and engage in story time experience stronger parent-child relationships and learn valuable language and literacy skills. (healthychildren.org). We use the Epic! app every single day at my house. When the kids ask me how squirrels can climb trees- I say l “let’s look it up on Epic!”. The app gives them access to 20,000+ children’s book titles from a phone, tablet, or PC. It’s a great way to keep them entertained and learning at restaurants, in waiting rooms, or in the car. We love this app so much, I want to share a link with you so you can get started right now with a 30-day trial: Read FREE for 30 days! These fun little activities are great for preparing for kindergarten school work (and also for spending some extra mommy-and-me time!). Now that Mom has spent five years preparing for kindergarten, kindergartener has all the tools he needs, and the family has a solid plan in place to help everyone through this transition, your family has everything you need for an amazing kindergarten school year!